The University of Saskatchewan has an effective and easy-to-use Single-Stream Recycling program. This means that all clean recyclables can be placed in any blue bin around campus and they will be effectively removed from the waste stream. Nearly everything can be recycled, so take the time to get to know and embrace the Single-Stream Recycling system around campus to help us reduce waste. For more or printable information, please refer to our Single-Stream Recycling Guide. *Paper should be clean and uncontaminated. **Plastic bags and film is no longer recyclable and must go into the landfill. ***Paper coffee cups are recyclable, though please be sure to empty all liquid out before putting them into a recycling bin. Batteries (alkaline, lithium ion, nickel-cadmium, nickel-metal hydride), cell phones and other small consumer electronics can be placed in bins in several locations across campus. If you do not have an electronics recycling bin close to your location, leave these recyclables with your custodian to be picked up by our recycling co-ordinator. Note that safe disposal of lead-acid batteries used for research or other university operations are handled by Safety Resources. A map of electronics recycling bins can be accessed below. Supreme Basics Recycling Program: Just hand any cartridges to the Delivery Driver when he arrives with your next order. USask IT Acquisitions: Just drop off any cartridges to their front desk at Room 38 of the Education building and they will deal with the rest. Return them directly back to the manufacturers (Lexmark, HO, Ricoh, Xerox). Details here. Supreme Basics, the university's contracted supplier for office and IT supplies, will take back your empty toner and ink cartridges as part of their sustainability program and ensure they are properly recycled. Simply return them to the Supreme Basics driver on the next visit, or contact the dedicated customer service team, or add a note on your next online order to request a pickup. All contacts for the program provided by Supreme Basics can be found on the Purchasing Services website. For information on the best places to donate or recycle various materials or items, the Saskatchewan Waste Reduction Council has a searchable database. Some things need special handling for safe recycling or disposal. For example, compact fluorescent bulbs have small quantities of mercury in them. The City of Saskatoon recycles or disposes safely of a variety of items or materials at their monthly Household Hazardous Waste Days. All non-recyclable, non-hazardous materials can enter the university's landfill waste stream. 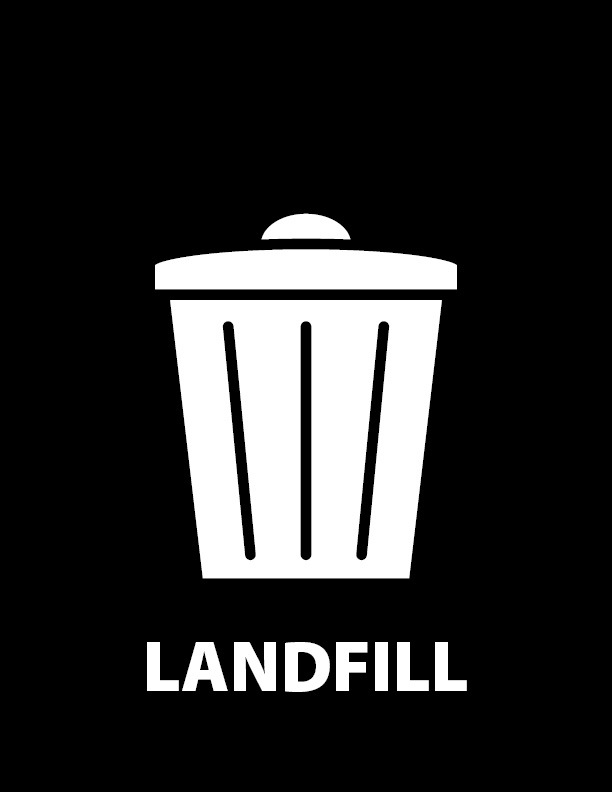 Remember that landfillable waste is the last resort in the waste hierarchy and that all other options—waste reduction, reuse, recycling, or composting—should be pursued if possible before waste enters the landfill. Recycling and landfill bins vary across campus, but all bins feature uniform signage as seen below. The following bins may be seen in offices around campus. Please reserve the large open blue bins for bulk paper and cardboard recycling. 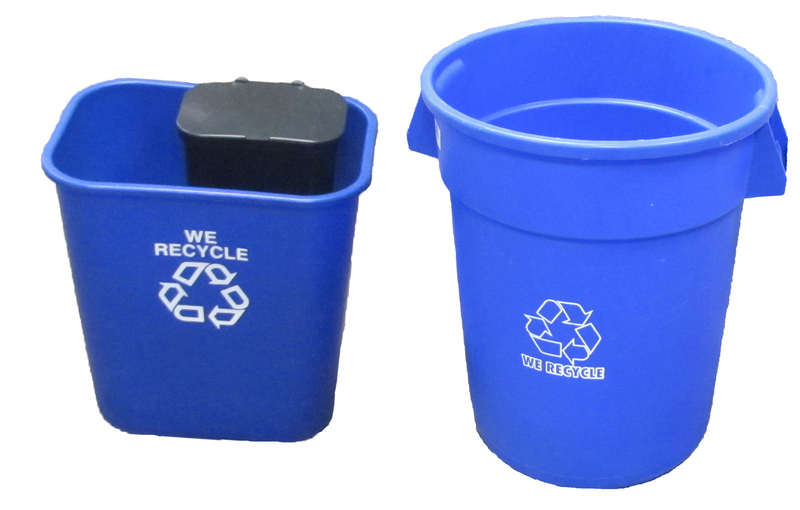 For small blue bins with the small black side attachment, use the black bin for landfill waste. The following bins be seen around campus outdoors. The "Big Bellies", while featuring different signage, are still fine for recycling (left) and landfill (right) waste. Please do not use large university dumpsters for personal waste. Following the Office's Community-Based Social Marketing recycling communications revamp in 2015, we have begun rolling out educational signage to accompany some of our bins around campus. 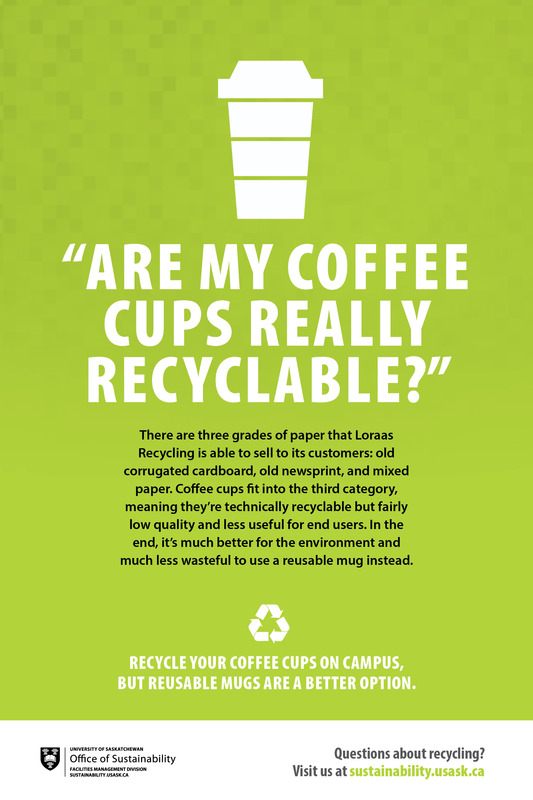 These posters are meant to highlight some of the more troublesome or confusing aspects of campus recycling and should help to clear up misconceptions. The five different posters can be seen in PDF format below. Plastic bags and film is no longer recyclable and must go into the landfill stream. While the university's Single-Stream Recycling program is very easy to use, there are some limits to the kinds of items that can be recycled. Special Note: It may be possible to compost these items. While the university does not offer a campus composting program, individual clubs or units may offer composting services. Check with those around you to see if there is a local option for composting these items rather than adding them to the waste stream. Contact us at the Office of Sustainability for light bulb recycling options. Certain recycling stations around campus offer electronics and battery recycling. Identify one closest to you and use it for this purpose. 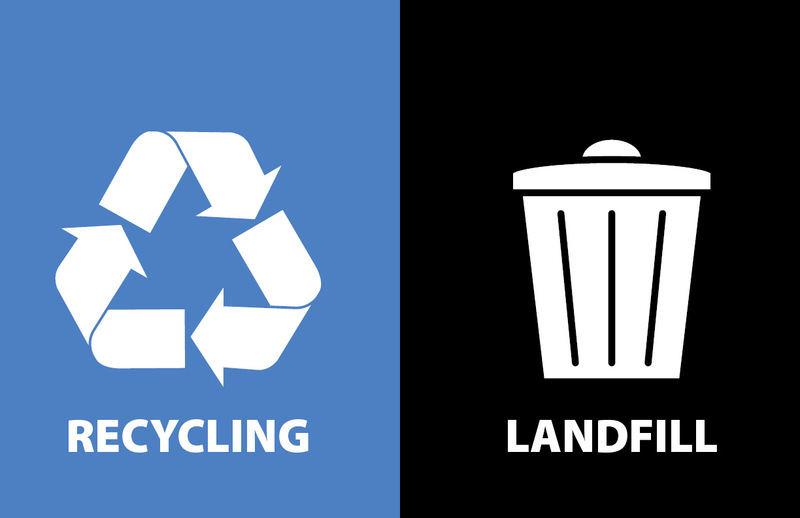 Are you planning a special event and need recycling services for it? Do you need help planning the event to ensure it does not generate a lot of waste? The Office of Sustainability has many resources and tips available for making sure your event maintains a minimal waste footprint. Read more at our Sustainable Events page. For conferences or meetings, the Sustainable Conference Guide has practical tips for hosting a meeting or conference. The Saskatchewan Waste Reduction Council also has some great advice on greening events. For all other requests, feel free to contact the Waste Prevention Co-ordinator for assistance. Net revenue from this program will be directed towards sustainability initiatives on campus. These endeavors could include: expansion of our program to encompass other materials, grants for research projects, hosting symposiums, scholarships and bursaries, and many other initiatives. We employ U of S students. Recycling takes a strain off of our waste disposal system and keeps our campus beautiful. Consumer goods like beverage containers are made from non-renewable resources. Due to waste, these resources are being rapidly depleted. Non-renewable energy sources are major inputs to the manufacturing and distribution of bottles, cans, and containers. Excessive energy consumption contributes to global climate change. 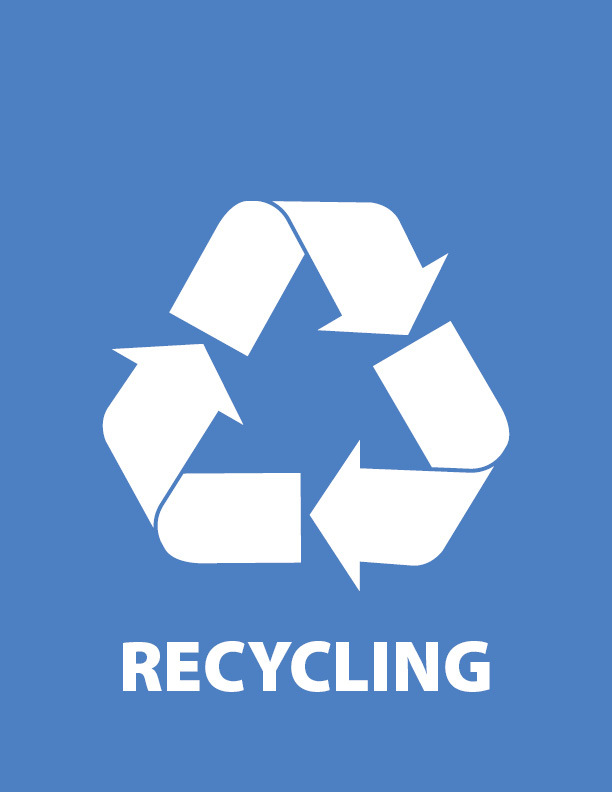 Recyclable materials in the waste stream take up valuable landfill space and are not biodegradable. 10% of the world's aluminum supply is consumed by beverage containers. Recycling will help conserve this resource. It is 20 times more energy efficient to recycle an aluminum container, than to manufacture it from scratch. Conserving landfills preserves land space for other uses such as farmland or natural habitats. Plastic recycling will reduce global dependence on oil. 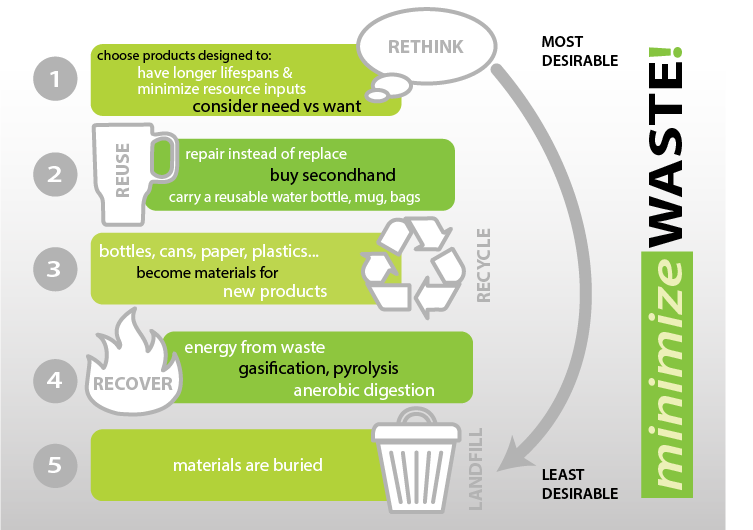 Minimize waste by following the waste hierarchy: first rethink, then reuse, recycle, recover and finally send waste to the landfill. Download a waste hierarchy poster here.